I am aware you can use a blade to make your own but, if you need to buy a marker anyway this is a really good choice. If you are going to cut your own, you probably want to see what this one is like first. Then, you can get a feel for how you want to cut yours later. I love OTR and these are just as fresh as any of the other markers on their line. Great quality. Reasonable ink. Looks hot first few days.. does fade within a month in the sun. Consider mixing.. even the colors will show through some black. since when does anyone want drippy calligraphy? if calligraphy is your thing then you need this marker. writes smooth and bold. 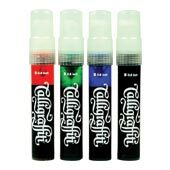 if you dont know how to write in a caliligraphy style i recommend you get this marker and try it out. its hard to start out but trust me. after experience with this your handstyle grows and you will definately stand out from the other artists. afterall you do want people to notice you, right?